The main quest line places players along a storyline that traverses with dialogues involving five different NPCs. Dialogue was handled so that players can access non-player character's opinions and thoughts without affecting the status of quests. 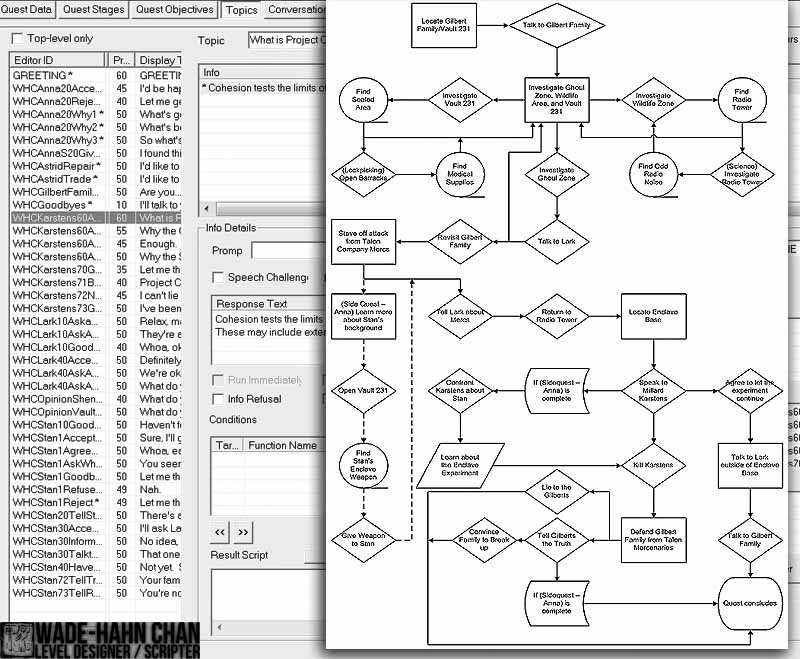 Most importantly, dialogue options and responses change based upon the story progression. The quest can conclude with one of three different endings based upon the player's choices. 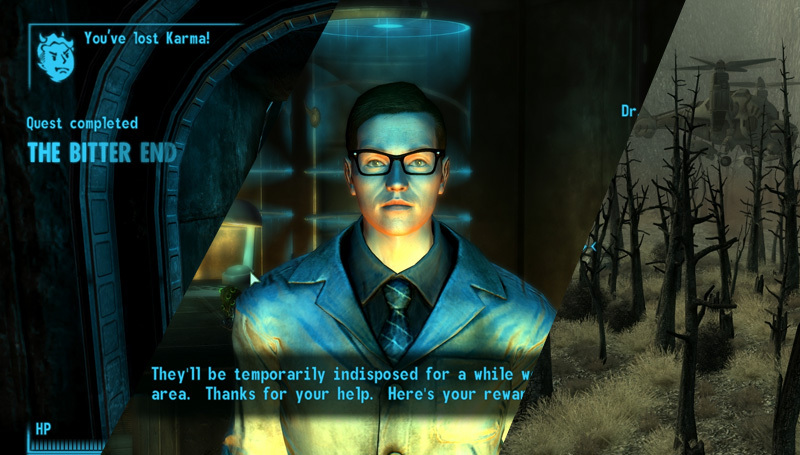 Two of the endings are accessed through the final dialogue choice in the game (pictured above is the "very bad ending"). To access the one good ending, the player must complete a sub-quest given by a side NPC character. Players can conclude the quest in any manner they wish. Additionally, each ending is sufficiently open-ended enough to imply further exploration of the story. The areas that the non-player characters inhabit feature a large number of side items and arranged set pieces. Little details clue the player into how the inhabitants live their everyday lives. 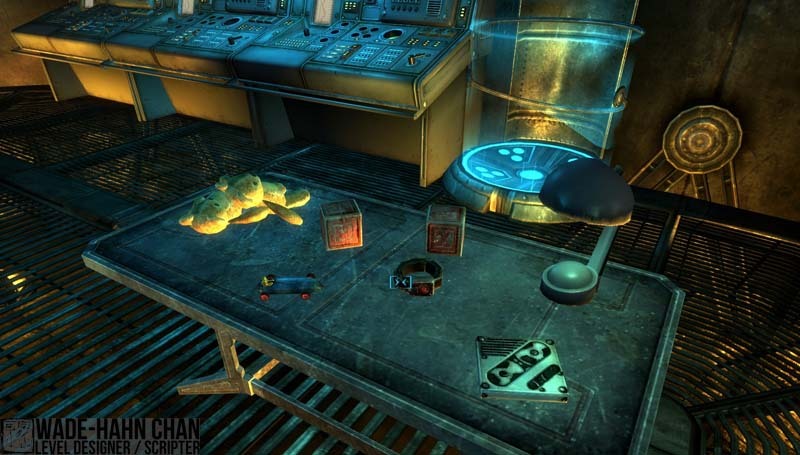 The screenshot above consists of gathered personal effects of one of the NPCs, a young child. The simple inclusion of a detonating slave collar on a table full of toys conveys a considerable amount of information about the character's back story. Other locations include small details--a stash of drugs that implies addiction, a barricaded front entrance to a vault showing a family's preparations for a last ditch defensive effort--that may be unimportant, but boost the overall atmosphere and player involvement.